Yi Quin was born out of an idea from 5 friends in the early eighties, they all had a passion for Chinese lion dancing but had no outlet for this. This is when it was decided to start a club in Southampton as there were no other groups locally. 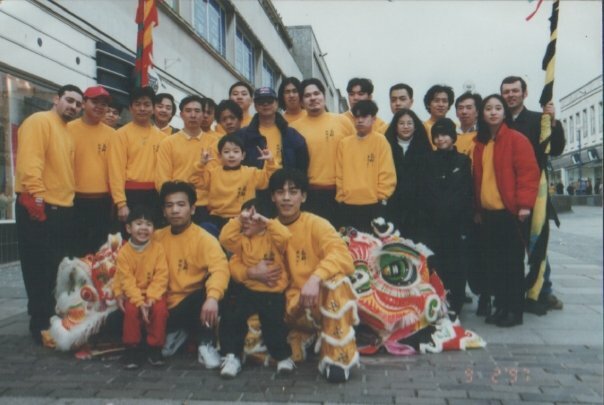 This gave us the title of the first lion dance club on the south coast. The name Yi Quin means friends together or as one, hence the family feeling you get from our club. We have clubs up and down the south coast in Southampton, Portsmouth and Bognor Regis that regularly practise to improve our skills for performances. We thrive on providing excellent performances and our dedication to this art form means we continue to developed fresh ideas, whilst sticking to the traditions that have been taught us over the years. 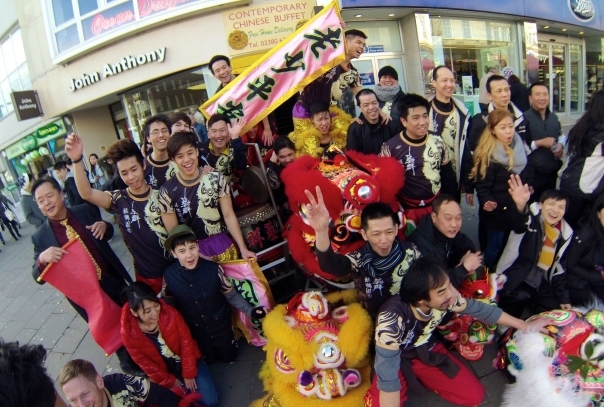 We are the South Coasts Premier Chinese Lion Dance Group. Our main base is in Southampton, but our performances have taken us to Portsmouth and Bournemouth, and have also included Brighton, Bristol, London, Isle of Wight, Cardiff, Ireland and even as far as Hong Kong. We are available all year round for any manor of events with Chinese New Year being our busiest time. Not to be mistaken for the Dragon Dance, the Lion Dance involves two performers – normally highly skilled martial artists – one as the head and the other as the tail, working in tandem to perform a range of moves, from traditional “Chut Sing” to stunt like jumps and lifts. The idea of the lion dance is to capture the nobility, strength and bravery of the Lion within Chinese mythology, and when the lion bows in three directions (bowing to heaven, earth and man) it symbolises peace and tranquillity and their mystical nature. Lions often adorn Chinese buildings as guardians, to protect and ward off evil and to bring the goodness of the lion to the household. 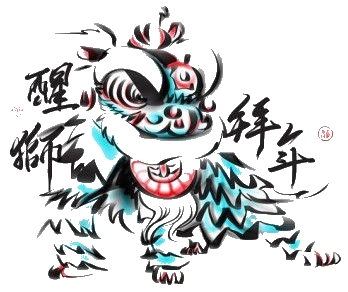 During the revolution against the Ching Dynasty Lion Dance became a form of protest and defiance against foreign rule and even a way of transmitting messages. Famous practitioners include Wong Fei Hung who was known as the ‘King of Lions’. The original Lion Dance was conceived around 2000 years ago in ancient China, during the Tang dynasty, and there are many folk stories that relate the appearance of the Lion in China. (Obviously the lion is not native to China). The most mundane explanation describes how lions came to China via the Silk Road trading route, probably from Persia or north Africa, as gifts to the Chinese Emperors; the Chinese were so impressed by these magnificent animals they attributed them to the Gods and over the years they have become part of the culture. Legend tells us that in ancient times the Lion existed as a mythical being, powerful and noble yet mischievous. Some say that the lion was initially sent by the Gods to protect the people from evil and sorrows plaguing the land, to fight demons and guard the land. However, the Lion became proud and arrogant, the Gods became tired of his troublesome and prankish nature when he challenged them and they stripped him of his power by removing his horn. The lion could no longer fight for the people without his power. However, the Goddess of mercy, Kwan Yin, felt sorry for the lion and repaired his horn with a red ribbon and gave him a mirror to ward off evil – these can still be seen on modern day Lions.